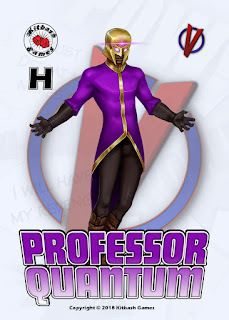 Rounding out the first four Season 1 Heroes, and the character who started this project. Doc Cosmos regularly lights up the night skies across San Gabriel with his flashy cosmic energy powers, establishing himself as one of his country’s most prominent heroes in the media and the public consciousness. However, few know the truth about his powers and how he acquired them. David Cross was a rock star in the astronomy world. Aged 26 he had more planetary discoveries to his name than anyone else, and had formulated his first emerging theories of cosmic flux particles. He was on the cover of popular science journals and crossed over to the mainstream. Working late one night at the San Gabriel observatory, the sky was suddenly filled with fluctuating ribbons of light. The light pulsed and shined downwards, bathing the city in intense colourful light, and centred on the observatory. Inside, David’s instruments went wild, and his prototype cosmic flux particle detector overloaded. Then, a bolt of energy raced through the building towards David, veering around objects as it moved. In the moment before it hit, David was sure he saw the face of his father in the light, a man who had been missing for twenty years. David was sure his father mouthed the word ‘son’ before the light washed over him and he blacked out. 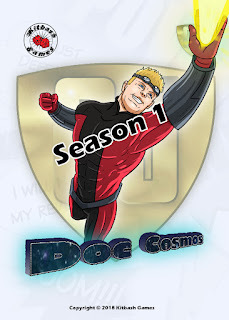 Hours later he awoke, imbued with energy and questions, and so the media-savvy hero Doc Cosmos was born.